BYRON MAYES, baritone, is a student at the University of California – Santa Barbara, pursuing both a Masters of Music and a Doctorate of Musical Arts in Vocal Performance under the guidance of Dr. Linda Di Fiore. He received his bachelor’s of music in vocal performance from Columbus State University. Following graduation he returned to his hometown of Houston, where he performed with the Houston Grand Opera chorus in production of Otello, The Magic Flute and Engene Onegin. He has since been a part of Opera Santa Barbara’s chorus, performing in their productions of Carmen and The Cunning Little Vixen. He was the 2017 winner in Vocal Performance of the Santa Barbara Performing Arts Scholarship Foundation. CHELSEA MELAMED, mezzo-soprano, received her bachelor of music degree from the Lawrence University Conservatory in Appleton, Wisc., and her Master of Music degree from the San Francisco Conservatory of Music. She was a Resident Artist in 2015 with Pittsburgh Festival Opera, and in the 2015-17 seasons she performed with the Cincinnati College Conservatory of Music while completing her doctorate in Voice Performance. She has performed a variety of comic and dramatic roles and made her New York City debut in an all-Strauss recital with the Cantanti Project. She is quickly making a name for herself as a young classical vocalist. ELLE VALERA, soprano, is a recent LA District winner and Western Regional Finalist for the Metropolitan Council Auditions. She is a former OSB Studio Artist, and covered leading roles in the Opera Santa Barbara production of Don Giovanni. Elle attended UCLA on a full scholarship as a Graduate Opportunity Fellow and received her masters degree in Music in 2014. 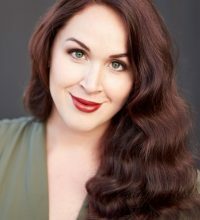 She earned a bachelor of music degree from the University of California, Irvine and is the recipient of several awards including the 2016 Pasadena Opera Guild Young Artist Award and Encouragement Award from the Los Angeles Metropolitan Council Auditions in 2014. She has performed as soloist with the UCLA Philharmonia and continues to perform as a soloist most recently with the Getty and Hammer Museums and Symphony Irvine. Elle is a plus-size model represented by Bicoastal Management and an Instagram influencer and blogger, promoting body positivity and diversity. JONATHAN WALKER-VAN KEUREN, tenor, has enjoyed a successful career both on and off the operatic stage performing works of the jazz, musical theatre, art song, and opera repertoires. His operatic performances include appearances as Martin in The Tender Land, Leon in Signor Deluso, Reverend Eager in A Room With a View, and, most recently, Basilio in Le nozze di Figaro. He also performed in the inaugural season of the Michigan State University Vocal Area Outreach Program. He spent the summer of 2017 as a Sherrill Milnes Studio Artist with the Savannah Voice Festival. He holds a Bachelor of Fine Arts from Indiana University and a Master of Music degree from Michigan State University. He received the 2016-17 Mackey Scholar of Vocal Music Endowment.